M Handzel, J Sibert, T Harvey, H Deshmukh, C Chambers. Monitoring the Oxygenation of Blood During Exercise After Ingesting Wheatgrass Juice. The Internet Journal of Alternative Medicine. 2008 Volume 8 Number 1. Although wheatgrass juice is believed to act as an ergogenic aid, little research has been done to prove its credibility. The purpose of this study was to explore one possible mechanism by which wheatgrass juice improves the human body—blood oxygenation. The ability of wheatgrass juice to increase blood oxygen saturation in the human body during exercise was observed via pulse oximetry. Participants ran on a treadmill for 20 minutes at 75-85% intensity, calculated by each participant's heart rate reserve, on two separate occasions. One session acted as a control and the other involved the ingestion of 2 ounces of wheatgrass juice 20 minutes prior to exercise. As a result of wheatgrass juice ingestion prior to exercise, participants’ blood oxygen saturation was an average of 0.31% higher during exercise than if no wheatgrass juice had been ingested. During an 8 min post-exercise recovery, participants’ blood oxygen saturation was an average of 0.23% higher after wheatgrass juice ingestion than that of a non-wheatgrass recovery. It can be concluded that a mechanism exists in the body that increases blood oxygenation level (SpO2) due to wheatgrass juice consumption. Recently, our group has conducted research to address the suggested phenomena that wheatgrass juice increases oxygen levels in the blood.9 The study involved pulse oximetry and the ingestion of wheatgrass juice during a period of rest.9 No increase in SpO2 levels was observed.9 During rest, red blood cells are at their full capacity to bind oxygen in a healthy human, which is a range of SpO2 from 95-98%.10 Therefore, it is logical that no change in SpO2 occurred in that particular research. In order to determine if wheatgrass truly oxygenates the blood, pulse oximetry must be used while the body is in a state of oxygen debt. Though during exercise blood vessels dilate in order to increase blood flow and available oxygen supply to the muscles, there is a point at which the available oxygen is insufficient to meet the energy needs of the body.11 In this study, pulse oximetry was used during 20-min aerobic treadmill exercises with and without the ingestion of wheatgrass juice 20 min prior to the run. The SpO2 levels for each participant’s control trial and wheatgrass trial were compared in order to determine if wheatgrass juice improves the human body’s ability to bind oxygen. It is possible that wheatgrass juice may increase SpO2 levels during recovery as well as during exercise. This means an individual has the potential to restore blood oxygen to a normal state faster than the body is capable of on its own. The two major components of oxygen recovery are alactacid oxygen debt, which is restored within seconds of stopping exercise, and lactacid oxygen debt, which takes several minutes as oxygen removes lactic acid from muscle cells.11 In this study, pulse oximetry was continued for 8 min after the 20 min exercise ended in order to assess the effects of wheatgrass juice on SpO2 during oxygen recovery. Thirty individuals, 21 female and 9 male, volunteered to participate in the study. The population ranged from age 18 to 51, with a mean, median, and mode of 21, 20, and 21, respectively. No age or gender limitations were applied to the study in order to maintain applicability to the general population. Subjects were recruited via word-of-mouth. In order to participate, individuals were required to sign an informed consent, a Physical Activity Readiness Questionnaire (PAR-Q), and a questionnaire regarding diet and exercise habits before each trial. If individuals answered “yes” to any question of the PAR-Q and did not have permission from their physician to run, they were not permitted to participate. Individuals were permitted to participate if they were non-smokers, exercised regularly, had never taken blood thinners, and had no allergies to foods similar to wheatgrass. NCAA athletes only participated with their coach’s permission. The study was approved for use involving human subjects by the Mercyhurst College Institutional Review Board. Wheatgrass. Wheatgrass kits were purchased from www.wheatgrasskit.com (Springville, UT). Each kit included five 53 cm x 25 cm black plastic growing trays, five 0.45 kg bags of organic wheatgrass seed, two bags of organic growing mix (animal-free forest based compost), and azomite, an organic fertilizer full of minerals and trace elements. Seeds were rinsed twice then soaked in tap water for one to two days prior to being planted. Organic soil was poured into a growing tray until it was evenly 2.5 cm thick, then a handful of azomite was sprinkled over it. The pre-soaked seeds were evenly distributed over the fertilized soil and covered with newspaper, which is printed by law with food-safe ink.12 The newspaper was sprayed with water until it soaked through the soil. The newspaper and soil were watered likewise each day until the grass was about 5 cm. The newspaper was removed and the grass was set under a grow light that was used for 12 hr per day. The wheatgrass was ready to be juiced once it was 15-20 cm tall. A commercial wheatgrass juicer (Miracle Pro Green Machine Wheat Grass Juicer, Model MJ575) was used to produce a 2-oz (59-mL) serving of juice within 30 minutes of consumption for each wheatgrass trial. A BCI® 3303 Hand-Held Pulse Oximeter with an Adult Finger Sensor and Polar® F4 heart rate monitor with a T31 transmitter were used to measure the SpO2 and heart rate, respectively, of each participant. The sensor was placed on the finger and SpO2 was measured as the participant stood in order to observe the participant’s resting SpO2 level. After five minutes, the participant began to run on a Star Trac® S-TR Treadmill or Trackmaster® TMX55 Treadmill at the participant’s preferred speed. After two minutes, speed was adjusted in order to achieve THR. Once the participant achieved the minimum THR, the 20 min exercise began. The pulse oximeter recorded SpO2 every 30 sec and heart rate was recorded every minute. Each time speed was adjusted in order to maintain the participant’s heart rate within his or her THR range, the adjustment was noted. Every five minutes the participant’s Rate of Perceived Exertion (RPE) was recorded as a percentage, and if it was ever at or above 85% (16 on the Borg Scale), the participant was asked to decrease speed despite heart rate.14 After 20 min passed at THR, exercise ended. SpO2 was measured for an additional 8 min while the participant stood. Experimental Wheatgrass Trial. Prior to the wheatgrass trial, each participant completed a questionnaire regarding updated exercise and dietary habits. Participants drank 2-oz (59 mL) freshly juiced wheatgrass. After 15 min passed, allowing a participant time to absorb the nutrients of the wheatgrass juice, the wheatgrass trial was conducted using identical monitoring methods as utilized in the control trial. The control trial was not always the first trial to be run for a given participant. Determination of the order of the control or wheatgrass trials per participant was by convenience of the participant and investigator. Six of the 30 participants performed the wheatgrass trial as their first trial. Data Upload. In order to transfer data from the pulse oximeter to a computer, TeraTerm software was opened and set up for a serial port, as recommended in the BCI® 3303 Oximeter Operation Manual. The pulse oximeter was connected to a BCI® Printer Interface Cable and null modem cable, and then turned on. Data automatically uploaded to TeraTerm, which was copied and then pasted into a Microsoft® Office Excel file. Data were analyzed using statistical analysis computer software (SPSS). Average SpO2 (%) and speed (mph) were compared per control and wheatgrass trial. The Kolmogorov-Smirnov test for normality and a dependent z-test were performed for SpO2 i) during exercise, ii) during recovery and iii) speed. 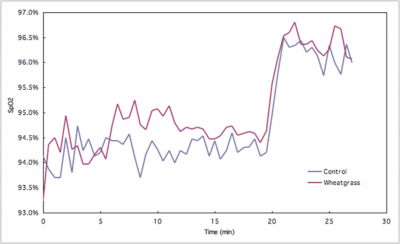 Pulse oximetry was used in order to monitor the blood oxygenation of participants before, during, and after a THR-based exercise. Analyses were conducted to determine if wheatgrass effected SpO2 level or speed in participants exercising at 75-85% intensity. The average SpO2 values during and after exercise for the control and wheatgrass trials are plotted in Figure 1. Differences in control and wheatgrass SpO2 averages during exercise can be observed (Figure 1). The overall average SpO2 for the control and wheatgrass trials were 94.3% and 94.6%, respectively. The average difference in SpO2 during exercise between the wheatgrass and control trials was 0.31%. Since the sample size for each trial was 30, normality was assumed. For the control dataset, the box plot showed one low-end outlier, and the box plot for the wheatgrass dataset showed one upper-end and two low-end outliers. Normality was satisfied for each dataset even with these outliers included, as determined by the Kolmogorov-Smirnov test for normality (p>0.05). At a 5% level, a significant difference was found between the SpO2 levels of the wheatgrass juice and control trials during exercise, since z = -2.244 and (p = 0.032) < ( = 0.05). Plot of the average of all participants’ SpO during 20-min exercise and 8 min recovery for control and wheatgrass trials. In general, participants decreased speed during the 20 min exercise in order to maintain THR. The overall average speeds for the control and wheatgrass trials were 7.16 mph and 7.23 mph, respectively. The average difference in speed between the two trials was 0.0622 mph. Box plots showed that no outliers existed for either the control or wheatgrass datasets. Thus, normality was satisfied, as confirmed by the Kolmogorov-Smirnov test (p > 0.05). However, at a 5% level, no significant difference was found between the speed of the wheatgrass juice and control trials, since z = -0.768 and (p = 0.448) > ( = 0.05). SpO2 dramatically increased once exercise ended (Figure 1) for both trials. The average SpO2 for the control and wheatgrass trials were 96.1% and 96.3%, respectively, during the recovery time (the 8 minutes immediately after exercise ceased). The average difference in SpO2 between the two trials was 0.26%. Box plots showed that no outliers existed for either the control or wheatgrass datasets. Thus, normality was satisfied, as confirmed by the Kolmogorov-Smirnov test (p > 0.10). At a 10% level, a significant difference was found between the SpO2 levels of the wheatgrass juice and control trials during recovery, since z = -1.995 and (p = 0.056) < ( = 0.10). Similar trends existed between the control and wheatgrass sessions. SpO2 appears to peak and valley at the same stages during exercise for the wheatgrass and control trials, though SpO2 during the wheatgrass run is generally higher (Figure 1). Though only by a small amount, participants sustained more oxygen (an average of 0.31%) during their wheatgrass trial exercise than they did during the control trial exercise. The data and statistics verify that wheatgrass increased blood oxygenation during exercise. Post-exercise SpO2 was an average of 0.26% higher for the wheatgrass trials during the 8 min recovery period. A slightly improved oxygen recovery can be observed from alactacid oxygen debt in the first two minutes of post-exercise rest due to wheatgrass juice ingestion, as the dataset’s SpO2 is higher than that of the control (Figure 1). Although by a smaller amount than during the exercise portion of the trials, participants managed an average of 0.26% more blood oxygen during the recovery period. The data and statistics verify that wheatgrass juice increased blood oxygenation during oxygen recovery. The difference in the wheatgrass and control trials’ speeds was insignificant. This suggests that despite the fact that blood oxygenation increased with wheatgrass, performance did not increase. However, several variables were not controlled due to difficulty between the two sessions, such as time of day of the trials, amount of sleep the night before the trials, diet and hydration, number of days between trials, fitness level, and the amount and intensity of workouts done previously on the day of the trials. These factors alone may have contributed to the insignificant difference in performance. In conclusion, the suggested phenomenon that wheatgrass juice can oxygenate the blood was tested using pulse oximetry during exercise. This study indicates that this natural pharmaceutical aids in blood oxygenation when the body is depleted of oxygen. However, this study was not a blind study; participants knew they received wheatgrass juice and not a placebo. Further research is necessary in order to account for the psychological aspect of wheatgrass juice as an ergogenic aid. The authors are thankful to the Mercyhurst College Research Assistant Program for providing financial support for the project. 1. Meyerwitz S: Nutrition in Grass. Wheat Grass Nature’s Finest Medicine: The Complete Guide to Using Grasses to Revitalize Your Health. Great Barrington, MA: Sproutman. 1999. 2. Bendich A, Shapiro, S: Effect of Beta-Carotene and Canthaxanthin on the Immune Response of that Rat. J Nutr; 1986; 116: 2254-2262. 3. Marwaha R K, Deepak B, Siftinder K, Amita T: Wheat Grass Juice Reduces Transfusion Requirement in Patients with Thalassemia Major: A Pilot Study. Indian Pediatr; 2004; 41: 716-720. 4. Lai C: Chlorophyll: The Active Factor in Wheat Sprout Extract Inhibiting the Metabolic Activation of Carcinogens in Vitro. Nutr Cancer; 1978; 1(3): 19-21. 5. Lai C, Dabney B J, Shaw C R: Inhibition of in Vitro Metabolic Activation of Carcinogens by Wheat Sprout Extracts. Nutr Cancer; 1978; 1(1): 27-30. 6. Chernomorsky S A, Segelman A B: Review Article: Biological Activities of Chlorophyll Derivatives. NJ Med; 1988; 85(8): 669-673. 7. Reynolds C: Thalassemia: Wheatgrass Shows Promise as an Effective Inducer of Fetal Hemoglobin. http://www.wheatgrassprofessional.info/thalassemia/thalassemia%20release%20version%20ebook.pdf. (Accessed February 18, 2009). 8. (a) Whole Life Greens. What is Wheatgrass? http://www.wholelifegreens.com/what.htm. (Accessed October 9, 2008). (b) Making Treatment Decisions: Wheatgrass. http://www.cancer.org/docroot/ETO/content/ETO_5_3X_Wheatgrass.asp. (Accessed April 8, 2009). 9. Pascuzzi M A, Chambers C C: Oxygenation of Blood After Ingesting Wheatgrass Juice. Internet J Alt Med; 2009; 7(2). 10. Hatlestad D: Progress in Pulse Oximetry – a Powerful Tool for EMS Providers. JEMS; 2001; 26(2): 54-66. 11. Oxygen Debt. http://www.brianmac.co.uk/oxdebit.htm. (Accessed April 8, 2009). 12. Howard S, Heimlich J E: Ohio State University. Community Development: The Safety of Newsprint Bedding. http://ohioline.osu.edu/ed-fact/0122.html. (Accessed April 8, 2009). 13. Goldberg L, Elliot D L, Kuelh KS: Assessment of Exercise Intensity Formulas by Use of Ventilatory Threshold. Chest; 1988; 94: 95-98. 14. Borg G A V: Psychological Bases of Perceived Exertion Medicine and Science in Sports and Exercise. 1982; 14(5): 377-381.